Radio Biafra was founded by Dr. Nnamdi Okwu Kanu, who as at this day is a Prisoner of Conscience (POC) in Nigeria since 14th October 2015 when he was abducted by the murderous government of Nigeria headed by Muhammadu Buhari. Those instrumental to the formation of the radio station includes Mazi Alphonsus Uche Mefor, Barr. Emma Mmezu and others. Mazi Nnamdi Kanu is the director of the radio station and also double as the leader of the indigenous People of Biafra, he is deputized by Mazi Alphonsus Uche Mefor. Radio Biafra was established in defense of the TRUTH, promotion of the right of the Indigenous People of Biafra, and for the total emancipation and the restoration of the nation of Biafra which existed over 4000 years before Nigeria. Radio Biafra propagates truth to mankind and exposes evil without fear or favor. It preaches the ideology that is “Biafra driven” in its totality. 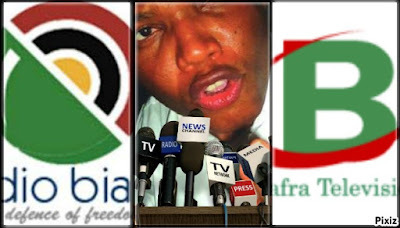 Radio Biafra is the mouthpiece of the voiceless Indigenous People of Biafra, it is a platform meant to salvage Biafrans, the most endangered species, who are being marginalized, exploited, subjugated, and people mapped out for total extermination by Nigerian government since the amalgamation of Nigeria by Lugard in 1914. Radio Biafra as an instrument for total liberation was configured by the founders and the leaders of the Indigenous People of Biafra, in such a way that people can tune in and listen from anywhere on the surface of the earth. And as a matter of fact, I can unequivocally say that anyone who wants to hear the truth should avoid Nigeria's gutter media and tune in to Radio Biafra regardless of one’s location on the planet earth. The freedom fighting system of the station as initiated by the leadership of IPOB is second to none; it is a strategy that has never been seen since the existence of mankind and the most beautiful since the inception of freedom fighting. READ: Biafra: Afra Descendants Movement (ADM) Declares Support for Biafra...Says "When our Ancestors met the White Man, They told them we are Biafrans And That is what we are." During the Biafra genocide of 1967-1970, by Nigerian government with the help of the British government, Nigeria used total media blockade against Biafrans and as a result, the world were kept in the dark about the genocide as their corrupt media reported absolute lies to the world. That is one of the reasons why the leadership of the indigenous people of Biafra with Mazi Nnamdi Kanu at the helm of its affairs, took it as a task to ensure that Radio Biafra is heard all over the world, to educate the international community, governments of respective countries, distinguished organization, individuals and lovers of freedom, on the plight of Biafrans, and also to inform the world on the current happenings in Nigeria and Biafra land, especially the evil actions of Nigerian government against the Indigenous People of Biafra. Considering the fact that Biafrans are scattered all over the world, it would have been a very difficult task to bring them together and activate the spirit of Biafra in every true Biafran without the station. Radio Biafra has brought Biafrans together in the spirit of brotherhood and camaraderie. Today, over 70 million Indigenous People of Biafra residing in over 100 countries and territories including Nigeria and Biafra land are well organized and are speaking in one voice, seeking the restoration of Biafra through self-determination chartered in the United Nation declaration of the right of the indigenous People. READ THIS: Biafra: Examining Buhari's Level Of Madness And The Cure: Yes Master Kanu, Indeed Buhari Is Raving Mad!!! Radio Biafra is an institution with high dimensional tutorship, it has produced uncountable graduates of history and propagators of truth, it has liberated millions of Biafrans and still liberating even the black race from mental slavery. Through the power of Radio Biafra, Biafrans have discovered their true identity, and are now proud to say: "I am a Biafran." Before the abduction and illegal detention of Mazi Nnamdi Kanu, the leader of the Indigenous People of Biafra, he was the host of the station until his arrest on 14th October 2015. He has traveled and broadcasted from over thirty countries of the world which includes: Malaysia, Kuwait, Trinidad and Tobago, USA, Ireland, Thailand, Ghana Spain, Sweden, Germany, not forgetting the host country, United Kingdom amongst several others. He also held town hall meetings with Biafrans in these countries, admonished and charged them to remains resolute in the struggle for the restoration of the nation of Biafra as the supreme God (Chukwuokike Abiama) who called him to do this work will not fail in his promise to restore Biafra for his children who are called by his name. It is unfortunate that Nigerian government under the administration of dictator Muhammadu Buhari abducted him claiming that he committed treasonable felony for championing the cause of the restoration of Biafra by broadcasting on Radio Biafra. It is only in Nigeria that broadcasting on air for ones liberation can be interpreted as treasonable felony. How pathetic! However, the peace-loving Indigenous people of Biafra IPOB are still calling the International community to mediate and expedite action for the unconditional release of Nnamdi Kanu and call for a referendum for the Indigenous people of Biafra to decide their faith. Radio Biafra is on CHK. 102.1FM in Biafra land. As a non-Igbo speaking Biafran, I must confess that I have learned a lot about Biafra and my identity listening to Mazi Nnamdi Kanu, Radio Biafra, and reading exquisite articles and essays by IPOB leadership, Biafra Family writers, etc. I thank God each day for Nnamdi Kanu. For me, he's God-sent prophet to liberate Biafra people and land from murderous Hausa-Fulani and Yoruba cowards. May God bless Nandi Kanu, his family, parents and siblings! May God continue to give IPOB the strength and wisdom to liberate Biafra from evil Nigeria and British Empire!